Going to war with a heat wave. Tomorrow is our big race of the season: Challenge Melbourne half-iron distance. Up until last week, I was really excited. But of course, Melbourne has turned on the classic extreme weather front that it pulls off so effortlessly, and the weather is predicted to be 40 degrees celsius (thats about 104 fahrenheit for my imperial readers). So that should be fun. And thinking about racing in such intense temperatures has of course taken my mind back to that awesome day in Las Vegas when I thought my body had turned into playdough. There’s a lot of lessons to take from that day out in the desert. I wasn’t anticipating the opportunity to put them into action under such extreme heat conditions quite so soon, however. Not long after the race in the desert, I tried to assess some of the things I would do better if I could go back and start again. I originally wrote the piece below for WITSUP, but the day after I sent it off, I ended up in the hospital with myocarditis, so we decided I should write something else instead. And my ‘lessons from your worst race ever’ got a bit forgotten. It’s only this evening that I read through it again, and thought it could be relevant for me now. The great thing about rock bottom is that it’s a solid launchpad. 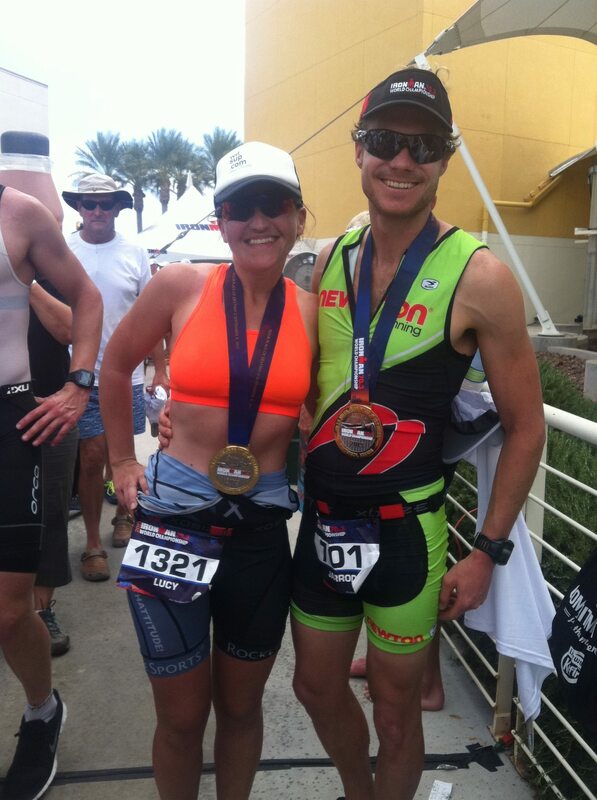 It’s been just over two weeks since I raced at the 70.3 World Championships in Las Vegas. I thought it about time to give a mini update, and provide some reflections on what happens after you have your first bad race. Because that’s right, I had my first bad race. And it wasn’t just bad – it was a shocker. The great thing about being a beginner is that everything you attempt becomes a PB. That first big race – there’s no way you can be disappointed as you don’t have a benchmark. But I gave myself a benchmark to get myself to Vegas in the first place, so it’s a shame that my first bad race happened to coincide with my first World Championship race. But lessons are lessons. And we take them and learn from them, whether they come in the form of feeling stoked after your best training ride ever, or being smashed out in the desert by a merciless course, against some of the best age-groupers around, and whilst going in rather underdone when it comes to training. In the run up to this race, I focused on every negative element of my build up (or lack thereof). I talked about illness. I talked about personal setbacks. I talked about work getting in the way of training sessions – this all occurred, but I made them the centre of the story of this race. What I didn’t talk about were the endless hill repeats on my road bike where I pushed myself to the edge for four hours and then came home and ran for an hour and a half. I didn’t concentrate on the relentless 400m sprint repeats on 1:30 that made me feel superhuman during training. I didn’t commit to memory the 100km time trials in the wind and lashing rain that proved my mettle. And so what happened on race day? I raced the race that I manifested from my own negative mindset. Had I instead focused on some of my big wins in training, it might have been a different day. Big lesson learned: mindset overrules everything. Think like a winner. Lesson 4: Respect the race. This is maybe my favourite lesson. It’s so easy to get complacent about completing a distance once you have conditioned yourself consistently in training. But do you want to complete the distance, or do you want to race the distance? There’s a big difference. Coming off the back of an Ironman, I had started to take the distance for granted. But being very inexperienced when it comes to racing, I neglected to give the racing element itself the respect it requires. Sure, I made it to the finish. I completed the World Championship 70.3 distance. But did I race it? But the best lesson I have learnt from my first bad race, is that when everything (and I mean everything) in my body, and almost everything in my mind, is telling me to quit – there was something that kept me going and pulled me forward to the finish line. Was it the lure of Vegas and the idea of finally being let loose on the Strip to hit the craps tables? Yes, maybe it was (and I had been hanging out for a plastic cowboy boot full of frozen margheritas for three days before the race). When I was splashing around like an extra in Jaws after 50 minutes (you read that correctly) in the swim, when I bonked on the bike before hitting the 10km mark, when I wept in T2 because I had nothing left, and when I crouched in a stinking portaloo on the run course in 43 degree heat because my gut was about as stable as Chernobyl in 1986 – it was impossible to go on any further. But somehow, it happened. It wasn’t pretty, but it was a finish. And this was the first time in my life that I learned that I can keep on going, no matter what. So now, back to today. More to the point – to tomorrow. So have I learnt anything from the lessons above? Well, we’ll see tomorrow. But I have definitely ‘identified my limiters’ and worked on my swimming. So fingers crossed I will have a comfortable, strong swim. I have hopefully talked a much more positive race than pre-Vegas, and have let go of lots of my own expectations, and instead focused on enjoying the process of training: working hard on my swimming, riding my bike with my friends, and running without any pressure. In terms of being prepared – there’s not a lot you can do top prepare for a scorching race, except hydrate of course. Needless to say I am high as a kite on Gatorade right this very second. Respecting the race is a big one, and since Vegas, I have been much more intimidated by the distance than I was before. But I trust in my training, so fingers crossed I can make it to the finish. Which segues nicely to the final lesson, which will no doubt be laid down as a personal challenge to myself tomorrow: I learnt that I can keep going, no matter what. Well, we’ll see. Off to bed now, gotta go to war with a heatwave tomorrow. Great post Pipes. We’d love to know what you make of Challenge Melbourne if you’ve got time? If you haven’t done it yet then good luck! Thanks Sparrow!!! It was an awesome day! And yep remember lesson 2 – you got this!!! Go get ’em. I hope it snows for you!! Well not that bad. I hate the crazy heat, give me the 15-22C any day of the week. Have an awesome day on the course and I am looking forward to a great race report. I can’t believe how cold it is where you guys are!!! That’s crazy, wrap up warm out there!!! Good luck, cheering you all the way. Go, Lucy, go! You will rock it, I’m sure. I can’t wait to read all about it!